O God, who through your Spirit raised up Saint Teresa of Jesus to show the Church the way to seek perfection, grant that we may always be nourished by the food of her heavenly teaching and fired with longing for true holiness. Through our Lord Jesus Christ, your Son, who lives and reigns with you in the unity of the Holy Spirit, one God, for ever and ever. St. Teresa's Teaching on the Grades of Prayer | Jordan Aumann, O.P. 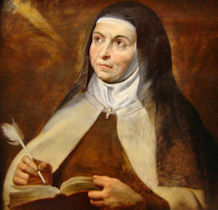 St. Teresa (1515-1582) was born in Avila and died in Alba, Spain. When only a child of seven, she ran away from home in the hope of being martyred by the Moors; in this way, she said she could come to see God. At the age of eighteen she joined the Carmelite Order and chose Christ as her heavenly Spouse. With the help of St. John of the Cross she reformed most of the Carmelite convents and founded new ones. She reached the highest degree of prayer and through prayer obtained such knowledge of divine things that in 1970 Pope Paul VI named her the first woman Doctor of the Church. St. Teresa of Jesus, honored by the Church as the "seraphic virgin," virgo seraphica, and reformer of the Carmelite Order, ranks first among women for wisdom and learning. She is called doctrix mystica, doctor of mystical theology; in a report to Pope Paul V the Roman Rota declared: "Teresa has been given to the Church by God as a teacher of the spiritual life. The mysteries of the inner mystical life which the holy Fathers propounded unsystematically and without orderly sequence, she has presented with unparalleled clarity." Her writings are still the classic works on mysticism, and from her all later teachers have drawn, e.g., Francis de Sales, Alphonsus Liguori. Characteristic of her mysticism is the subjective-individualistic approach; there is little integration with the liturgy and social piety, and thus she reflects the spirit of the sixteenth and following centuries. Teresa was born at Avila, Spain, in the year 1515. At the age of seven she set out for Africa to die for Christ, but was brought back by her uncle. When she lost her mother at twelve, she implored Mary for her maternal protection. In 1533 she entered the Carmelite Order; for eighteen years she suffered physical pain and spiritual dryness. Under divine inspiration and with the approval of Pope Pius IV, she began the work of reforming the Carmelite Order. In spite of heavy opposition and constant difficulties, she founded thirty-two reformed convents. Truly wonderful were the exterior and interior manifestations of her mystical union with God, especially during the last decade of her life. These graces reached a climax when her heart was transfixed (transverberatio cordis), an event that is commemorated in the Carmelite Order by a special feast on August 27. She practiced great devotion to the foster-father of Jesus, whose cult was greatly furthered throughout the Church through her efforts. When dying she often repeated the words: "Lord, I am a daughter of the Church!" Her holy body rests upon the high altar of the Carmelite church in Alba, Spain; her heart with its mysterious wound is reserved in a precious reliquary on the Epistle side of the altar. Patron: sickness; against headaches; against heart disease; lacemakers; loss of parents; opposition of Church authorities; those in need of grace; religious; those ridiculed for their piety; Spain; those named Teresa, Theresa, Teresita, Terry, Tessa, Teresina, and Tracy. Symbols: nun in habit of a Discalced Carmelite; Carmelite nun with her heart pierced by an arrow held by an angel; Carmelite nun holding a pierced heart, book and crucifix; Carmelite nun with book and quill; Carmelite nun receiving a message from a dove; roses and lilies; inflamed heart; IHS on a heart; flaming arrows; dove; book and pen; crown of thorns; heart transfixed with flaming arrows; scapulary; crucifix and lily. Read St. Teresa's bookmark. Perhaps as an art project write and decorate it, to keep it nearby as a reminder, or place in your own prayer book. Bake a special Spanish recipe, such as Paella, or Gazpacho or learn more about the variety of tapas. Also try your hand at some of the recipes bearing Teresa's own name, such as St. Teresa's Egg Yolks or Yemas or St. Teresa's Bread. Find out more about the Discalced Carmelites, and the hard sacrifices they follow in their Rule. Read the Autobiography of St. Teresa. See how human her writing is. Her other books Interior Castle and Way of Perfection are more difficult and lofty to read, but are spiritual classics. The books may also be downloaded online: The Life of St. Teresa of Jesus, Interior Castle and Way of Perfection.